Summer is crazy busy. Who has free time? I don't! What I need is an assistant. That's where the Shop Your Way Personal Shopper fits in. 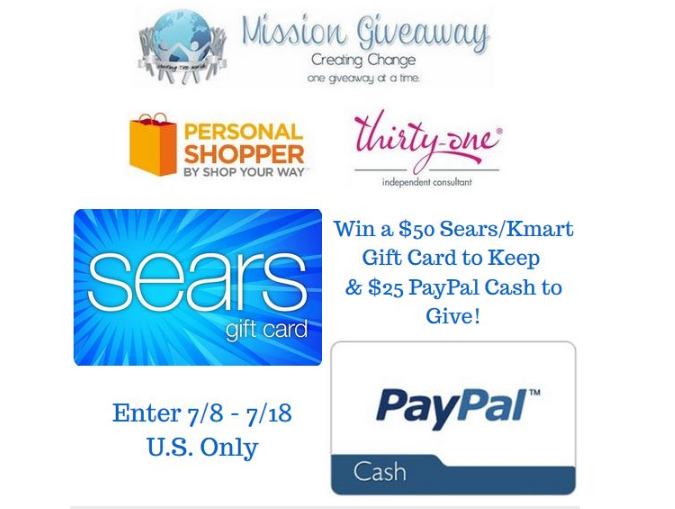 Shop Your Way allows you to earn and redeem points both in-store and online at Kmart, Sears, Lands’ End, Sears Auto Centers, and mygofer. When you sign up for FREE, you also get a "personal shopper" whose expertise can be called upon when needed. Make Tim (Review Dad) your personal shopper by signing up today! It means that Tim is available to help answer your questions about products and departments where his experience and knowledge might be useful to you. Confused about television screen resolutions and refresh rates? Need some advice on computer upgrades? Wondering which video games are appropriate and fun for your kids? Sherry Huckeba is an Independent Thirty-One Consultant here to help you organize your life with a splash of color. From bags and totes to storage boxes and wall organizers Sherry can help make becoming organized a lot more fun. Earn half priced and free products when you host your own Thirty-One party and don't miss out on the monthly specials. What does Thirty-One sell? Our stylish, affordable products are exclusive to Thirty-One. From our signature purses, totes and accessories to eye-catching storage solutions that help organize your life, you'll find something to fit every personality and situation. Each season, we develop new products built on the idea that our products must be functional AND fashionable. The Giveaway will open up on 7/8/14 12:01 am EST and Close on 7/18/14 at 11:59 pm EST.